Aruba offers something for every kind of traveler. Most come for relaxation, but once that’s achieved (which doesn’t take long, because have you seen the beaches?) the country becomes a choose-your-own-adventure book of vacation styles. Some focus on the food and drinks. Others love the casinos and nightlife. Still others want watersports or family-friendly activities. And then there are those who come for romance. As a writer for Menu International, I try to do everything, so that I can pass on my top experiences to you. I hunt for the best ceviche, grilled grouper, steak and beachside dining. I learn about millennia-old cave drawings. I feed horses at Philip’s Animal Garden. I sit on as many beaches as I can (in the name of research) while waves gently collapse on white sand in front of me. And I get locals to take me across the island in jeeps, on motorcycles or in cars to discover hidden places like the Centro di Pesca in the Spanish Lagoon, a quiet dock where local fishermen play dominos and fry lunch together after coming back with their morning catch. So, keeping in mind that every traveler has his or her own priorities and preferences while on Aruba, here’s my three-day guide. Hopefully you’ll discover something that ends up being the highlight of your trip, too. Eagle Beach before 7 a.m. is majestic, as you’ll discover while running along the edge of the water. Skirt the sectioned off leatherback turtle nests and dive into the turquoise water to cool off. Now that you’ve worked up an appetite, head to nearby Matthew’s Beachside Restaurant for an Aruban breakfast. Then beat the crowds downtown to shop for locally designed jewelry at Little Europe or local organic cigars at Aruhiba Cigars. If you still have time before happy hour, drive out of the city along dusty roads past sparse hills, wind-stunted trees and roadside snackbars on your way to the Natural Bridge. Though the original bridge on Aruba’s North Coast collapsed, a smaller bridge still stands as a witness to the destruction. It’s worth the trip just to see the dramatic view of waves pounding the shore – which explains why the days of the original bridge were numbered. With so many options, there are five key elements to consider when choosing the best Aruban happy hour: convenience, ambiance, alcohol quality, selection and price. There are three daily happy hours at Ricardo’s Restaurant & Bar, with Thursday nights turning into a karaoke dance party with the staff. But then there’s Smokey Joe’s, with its constant party atmosphere (and huge cocktail selection). Horizons Bar’s elevated happy hour at the Amsterdam Manor comes with a great view, a bartender who greets you by your name and a snack menu of crispy fried Dutch bitterballen or wings. And the Divi Bar & Lounge at The Ritz-Carlton can’t be beat in terms of class (and sushi). But happy hour connoisseurs know that whatever option is closest to either your hotel or your dinner reservations will win out more often than not. You were up early, so a couple of rum punches later, there’s no reason not to take advantage of the early-bird tenderloin special at Tango Argentine Grill. You can even sit and enjoy the live music out front as long as your eyes will stay open. There’s no harm in turning in early, since Eagle Beach will be all yours again come tomorrow morning. You’ll need a land rover, a horse or hiking boots (plus a lot of sunscreen) to explore Arikok National Park on your own. But numerous tour companies offer excellent full and half-day excursions that help you discover its 7,907 acres of lava, quartz diorite, and limestone geological formations, including the Fonteine Caves where our guide Stan explained that the millennia-old drawings on the ceiling were made by the shaman of the indigenous Caquetío Indians while under the influence of hallucinogenic substances. It’s too bad the hollow stalagmites had yet to form at that time, because the buffalo-shaped one resonates with a Blue Man Group-style ‘boom!’ that a tripping shaman would surely appreciate. Aruba didn’t even have a national parks service until 1997, but it’s now working hard to safeguard and appreciate its natural history. And there are lots of ways for locals and visitors to get involved or contribute. The Facebook group Cave Hunters Aruba explores the island’s most mysterious nooks and crannies. The Aruba Lion Fish Initiative raises awareness of the invasive, coral reef-destroying lion fish. And the Aruba Turtle Protection Program makes sure those leatherback turtle nests are safely guarded, while informing people about the species (did you know that only a few of the eggs a female lays each year will live to maturity?). The easiest way to help is by eating the dastardly lion fish in the form of ceviche at Passions on the Beach, which is where you should go for dinner. The on-the-beach location has ample space between tables to create an intimate dining experience. Or just enjoy the panoramic sunset while you wiggle your toes in the warm sand and sink your fork into tender grilled grouper, lamb chops or juicy shrimp. With so many gorgeous beaches on Aruba, it’s easy to spend a day beach-hopping. Pack a picnic of papaya, passion fruit, local Balashi beer and Dutch cheeses (the island is a constituent of the Kingdom of the Netherlands) and start at Baby Beach. The location near the southeastern coastal town of San Nicolas is shallow and quiet compared with Palm Beach in the high-rise hotel area and even Eagle Beach in the low-rise area (post-7 a.m., that is). Rent snorkeling gear and swim with the little (and big) Nemos that call the waters home. To explore more offshore snorkeling sites, including a World War Two shipwreck, join a two-stop or three-stop catamaran snorkeling tour. The tours often include lunch and drinks and are fun for all ages. I had a great time dancing to reggaeton with a six-year-old from Miami while her mom sipped an Aruba Ariba from the open bar, between snorkeling stops. End your day at one of the island’s longest-standing restaurants – itself a bit of Aruban history. At Madame Janette, order a feast of ceviche, crab cakes, beef carpaccio, surf and turf, an epic burger loin, roasted bacon potatoes, cheesy soufflés, seared tuna tataki and firecracker shrimp. The wine list is one of the best on the island and includes several exceptional Brunello del Montalcino for a special occasion. There’s also an extensive craft beer list with a Belgian slant. 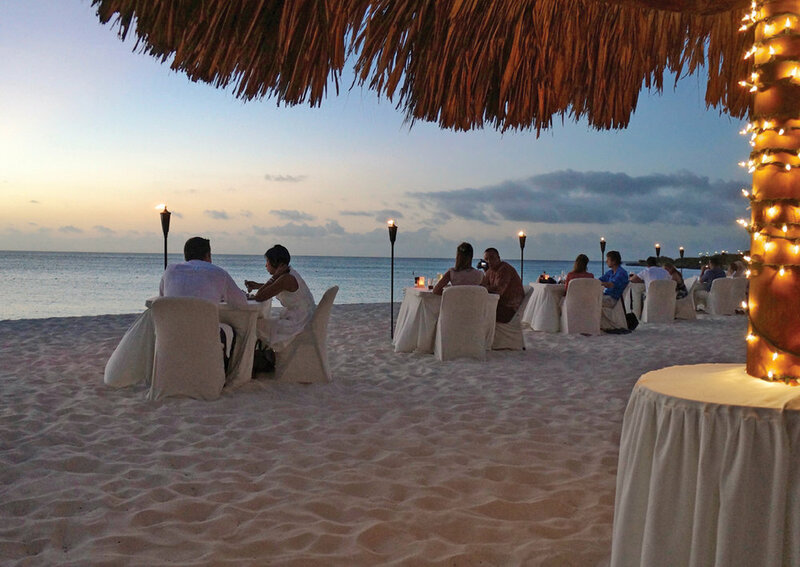 As the sun sets on the restaurant’s back garden and a live guitarist starts in on an acoustic version of “Aruba, Jamaica, ooh I wanna’ take ya’…”, you’ll know that you really are on one happy island. And, like so many others who’ve fallen in love already, you’ll be back.